Yaple Park was named after the first family who were farmers of this land. There were 103 homes built in Yaple Park between 1929 and 1938 are mostly Transitional Ranch style homes. 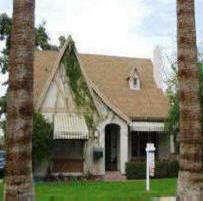 The Yaple Park Historic District lies in north central Phoenix and follows the original 1929 Yaple Park subdivision plat 1929 in it is bounded by Minnezona Avenue to the north, Turney Avenue to the south, Seventh Avenue to the west, and Third Avenue to the east. Its northern border, Minnezona, abuts the Grand Canal, an integral part of the regions irrigation system. Yaple Park was developed in three distinct building campaigns that reflect different eras in Phoenix's residential subdivision in the early- to- mid-20th century. The initial phase consisted of the Yaple farm and associated resources, such as the ca. 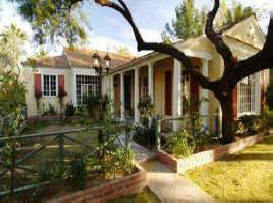 1900 Yaple house, a tenant house, and barns, greening rooms for citrus fruit, sheds and other agricultural features. The Yaple House and agricultural resources are gone but a ca. 1924 tenant house at 615 W. Minnezona Avenue survives from this first era. The second phase is associated with the 1929 Coggins Title Company subdivision of Yaple Park which laid out Turney, Roma, Campbell, and Minnezona avenues. Ten houses were built between 1929 and 1935 when the Great Depression dampened development throughout the country. The third and most productive phase began in 1937, when Phoenix developer Floyd Medlock began purchasing lots in Yaple Park. With newly available Federal Housing Administration (FHA) loans, he helped prospective buyers become homeowners in the tract. Within three years, Medlock oversaw the construction of 59 new homes, most purchased with FHA financing. The remaining lots, also backed by federal financing plans, were developed after World War II in the 1940's and 1950's. Yaple Park, like many early mid-century subdivisions, was carved out of farmland on the outskirts of Phoenix. James M. and Sue Ross Yaple moved to the Phoenix area in the late 1800's and in 1899, they purchased two adjacent farm tracts fronting onto the Grand Canal, in present north Phoenix. The two parcels were later subdivided as Yaple Park and now comprise the Yaple Park Historic District. Soon after they purchased the land, the couple built a house on Seventh Avenue, near the canal. (The Yaple House no longer stands.) At the time, the farm was out in the country, well beyond the Phoenix city limits. The Yaples engaged in several occupations; they bought and sold property and farmed their home tract with water from the Grand Canal, an early pioneer canal in the Salt River Valley. Under irrigation, the farm produced grain crops and citrus fruit. Agricultural outbuildings such as barns, sheds, and greening rooms for citrus, likely were constructed on the land. In 1924, a second house was built for a zanjero who oversaw Yaple's irrigation system. Built in a Southwest style, the house at 615 W. Minnezona Avenue is the only surviving resource from this first development period. Mr. Yaple died in 1911 but his wife, Sue, maintained the farm for another eighteen years before negotiating a development deal with the Coggins Title Company in 1929. The company had every expectation of success; L.W. Coggins, its president, had considerable experience in Arizona real estate ventures. His thirteen years as manager, and then sole owner, of one of the states largest title companies Phoenix Title & Trust; undoubtedly helped him in his successful mayoral bid in 1906. Coggins was re-elected for a second term and under his leadership, Phoenix established a municipal water works, initiated a major sidewalk program, eliminated the city's debt and balanced its budget. In 1923, Coggins started the Coggins Title Company with his son, Ralph. The company flourished in the Phoenix building boom of the 1920's and Yaple Park was expected to be yet another accomplishment to their credit. The Coggins Title Company filed the Yaple Park subdivision map with the Maricopa County Recorders office on April 22, 1929. The subdivision covered the Yaples two farm tracts which were tucked between Third and Seventh Avenues, just south of Grand Canal. 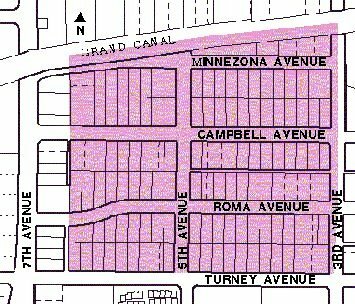 It consisted of six long blocks with between 21 and 24 lots, most of which fronted onto the east-west streets: Turney, Roma, Campbell and Minnezona Avenues. The northernmost street, Minnezona, generally followed the alignment of the Grand Canal which formed the subdivisions northern boundary. The Yaple House and zanjero house remained on their lots near the Grand Canal; the Yaple House fronted onto Seventh Avenue and the zanjero house faced Minnezona and the canal. The Coggins hired Gammon and Gammon to promote the subdivision and on August 11, 1929, the advertising firm reported that two homes had been completed and three more were under construction. Two months later, the stock market crash and ensuing depression all but halted construction in the development. Only ten homes were built between 1929 and 1935. Those that were completed adopted popular styles of the day including the Southwest Style, English Cottage, and Transitional Ranch, a harbinger of the many Ranch style variations that would appear in the late 1930s and through the postwar period. His first venture, Medlock Place, was carved out of a 25-acre cotton field and divided it into 46 lots along both sides of Colter Street between Central and Third avenues. The following year, Medlock purchased 20 acres of land at the northwest corner of Camelback and Central, adjacent to Medlock Place. He called the new subdivision South Medlock Place and dedicated the main streets for commercial development and reserved Pasadena and Medlock streets, for residential construction. Medlock placed minimum price restrictions on his subdivisions to assure prospective buyers that the neighborhoods would be high-class developments. He worked through the 1920's and 1930's to sell lots in his early subdivisions. Even during the Great Depression, Medlock avidly promoted his remaining 42 lots by advertising Medlock Place (Listed in the National Register June 2006) and South Medlock Place as having a complete network of paved streets, water and disposal systems, electrical and telephone service and dotted with more than 5,000 trees (Arline, Phoenix Gazette 1985: A). In 1937, Medlock turned his attention to Yaple Park. On November 7, 1937, he launched an advertising campaign in the Arizona Republic announcing the opening of Yaple Park (See Advertisements for Yaple Park in the Arizona Republic November 7, 1937 in Additional Items). Of course, subdivision development in Yaple Park had started in 1929, with ten homes built by 1935, but the Depression had brought construction to a standstill and Medlock seized the opportunity to turn things around. The economy may have played a role in Medlocks promotion of Yaple, as well; he offered affordable houses to average Americans. This theme was reiterated by builder W.M. Rasmussen who placed an ad to accompany Medlocks and described Yaple Park as priced for average Americans to afford these beautiful homes are your answer to better, happier, more economical living. To reach these average Americans, Medlock noted the availability of the new Federal Housing Authority (FHA) financing for the Yaple Park development. Such loans were intended for Medlock's ideal demographic. Lots sold at prices ranging between $400 and $550, with $100 down payment and only $15 per month (Arline, Phoenix Gazette 1985: A). The Coggins Title Insurance and Trust Company continued to issue titles for the property (The Arizona Republic, November 7, 1937: 6). Medlock's initial promotion extolled the virtues of suburban life in Yaple Park such as mountain views, cooler summer temperatures, and irrigation. He acknowledged that the subdivision was about two miles north of the Phoenix city limits, but that paved streets on either side of the Medlock neighborhood would allow the businessman to live in a pleasant suburb yet be within a few minutes drive of his office. His opening day ad also noted that the development had rigid building restriction that would insure each home owner absolute protection on his investment. An article in the same issue of the Arizona Republic noted that these restrictions were the evolution of tried and tested covenants and were supported by the Federal Housing Administration. Both frame and masonry houses were allowed, but frame houses had to be larger in size to maintain equivalent values. The article went on to note that the restrictions in Yaple Park were intended to result in a desirable subdivision appearance and would allow a homeowner to protect his rights without infringing on others (The Arizona Republic, November 7, 1937: 6). Like many early 20th century developers, Medlock generally sold lots to individuals who then hired contractors to build their homes. His subdivision restrictions assured quality control for building size, type, setback, materials, etc. but style was largely left to the individual homeowners. The district already featured a number of different Period Revival styles. 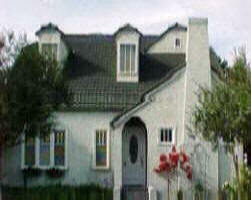 As a result, the district features a variety of residential styles spanning the mid-1920's through the 1950's. Medlock also approved the Modernistic Romley house at 505 Roma Avenue (See Modernistic Home Attracts Attention from the Arizona Republic, April 24, 1938, in Additional Items). However, variations on the Ranch style prevail as most of the houses were built during the late 1930's and in the postwar era when the style enjoyed its greatest popularity. Use of Federal Housing Authority loans affected building designs and methods as they encouraged efficient floorplans, ceiling heights, and materials. Medlock's venture was highly successful in light of the depressed economy. A total of 56 houses (51%) were built in Yaple Park between 1937 and 1940. The accomplishment was due both to Medlock's enthusiastic promotion and attention and to the newly available FHA loans that made home ownership possible for working and middle class families. Restrictions on nonessential construction during World War II again stymied the completion of Yaple Park. Although some houses were constructed during the war, the district was finally built out in the postwar period. Many were built in 1946, right after the war (Phoenix city directory, 1946), although a few vacant lots remained at the end of the 1950's. From the start of World War II in 1941, through the postwar period ending in 1960, thirty-four homes were constructed in Yaple Park. By the late 1940's, Phoenix had grown out to encompass Yaple Park and residents in the quiet suburban tract began to feel commercial development pressures, especially along Seventh Avenue. In 1949, Yaple Park residents requested annexation by the city of Phoenix because they hoped the city would impose restrictions on commercial building in the otherwise residential area. Yaple Park's deed restrictions had previously been declared invalid by a court of law. Corwin Mocine, city planning director, was quoted in the Arizona Republic as saying. This is an example of the weakness of deed restrictions in accomplishing the orderly growth of residential areas. He went on to explain that city regulated zoning was required to control commercial growth (Yaple Park Area Seeks Annexation by Phoenix, The Arizona Republic, January 29, 1949). Despite the loss of Seventh Avenue to commercial development, the remainder of Yaple Park remains entirely residential.